Our professional shop manager, John Goodenough, leads a team of dedicated volunteers who give up 3-4 hours of their time to work a shift in the shop or to help out in other ways. John lives near Oxford with his wife and three children. 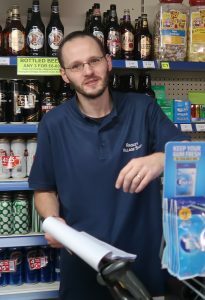 He has a wide experience of the retail sector, having previously worked for the Co-op for nine years. John has been manager of Radley Village Shop since it opened in May 2007. Become a volunteer. Could you spare a few hours of your time either regularly or occasionally to help our village shop? Either speak to the shop manager or contact our Rota Manager, Jenny Stead (email rota@radleyvillageshop.com). Regular newsletters help keep everyone up-to-date with what’s happening in the shop.